Various protocols are being followed for endophthalmitis prophylaxis in cataract surgery, and this subject continues to be a matter of debate. We summarize the most recent evidence-based studies on this topic with additional stress on intracameral (IC) antibiotic prophylaxis. Here, we discuss several large, international clinical studies which discuss the efficacy, adoption, safety, cost, and newer trends in antibiotic prophylaxis. Majority of these studies report a significant reduction in endophthalmitis rates with IC antibiotic prophylaxis. Efficacy data have been reported for IC cefuroxime, vancomycin, and moxifloxacin. Surgeons are now looking for alternatives to vancomycin for IC prophylaxis because of its association with the rare but sight-threatening complication of hemorrhagic occlusive retinal vasculitis. A recent large clinical study shows convincing efficacy with IC moxifloxacin prophylaxis. Two large studies have also reported significant endophthalmitis reduction following use of IC antibiotic prophylaxis, in eyes with posterior capsule tear which are at highest risk for infection. Except for one randomized controlled trial, there is a lack of prospective data on this subject; however, considering the complexity of performing such studies, surgeons have to rely on the mounting evidence from other recent big data studies. Availability of approved intraocular antibiotic formulations will see a much higher adoption in the future. India accounts for about one-third of the world's blindness. Cataract is the leading cause of blindness and cataract surgery is by far the most commonly performed procedure. Endophthalmitis following cataract surgery although very rare is one of the most serious, sight-threatening complications of ocular surgery. According to the Endophthalmitis Vitrectomy Study, visual outcomes are often poor. With the significant increase in cataract surgery volume due to aging population worldwide, effective endophthalmitis prophylaxis is a rising global imperative. The use of perioperative povidone-iodine and an eyelid speculum and drape with isolation of eyelids and eyelashes, as well as meticulous sterile preparation, is effective in limiting the incidence of endophthalmitis after cataract surgery. Recently, there is more interest among cataract surgeons regarding the use of intracameral (IC) antibiotics; it is important to be aware of the published evidence so as to allow surgeons who are considering adoption of IC antibiotics, to make this important decision. In this article, we present key findings of the studies, with further emphasis on the articles published over the last 2 years. There is wide variability in the use of topical antibiotic prophylaxis. In contrast to povidone-iodine preparation, the evidence supporting topical antibiotic prophylaxis is not as compelling, leading some surgeons to forgo it entirely. The theoretical goal of topical antibiotic prophylaxis is to reduce the conjunctival bacterial load, thereby lowering the risk of intraocular contamination either intraoperatively or postoperatively. Strong evidence to support its efficacy is lacking, and there is the theoretical risk that prolonged and repeated administration may induce bacterial antibiotic resistance. The vast majority of respondents in the 2014 American Society of Cataract and Refractive Surgery (ASCRS) survey (90%) used topical perioperative antibiotics and virtually all surgeons used it postoperatively (97%). Topical antibiotics are frequently used for up to 1–2 weeks postoperatively until the incision fully heals and should not be tapered as this would encourage emergence of resistant organisms. Efficacy of IC antibiotic prophylaxis continues to remain controversial because of paucity of level 1 evidence. The 2006 European Society of Cataract and Refractive Surgeons (ESCRS) study is the only prospective, randomized controlled trial, which tested endophthalmitis prophylaxis for cataract surgery. They reported a significant reduction in endophthalmitis rates with IC cefuroxime injection., This landmark trial enrolled 16,603 total patients and provides the strongest support for the efficacy of IC antibiotic prophylaxis. The rates of culture-proven endophthalmitis in the two groups receiving IC cefuroxime prophylaxis were 0.050% and 0.025% compared to 0.226% and 0.176% in the two groups without IC antibiotic. Overall, direct IC cefuroxime injections resulted in an almost 5 fold decrease in the rate of culture-positive endophthalmitis. However, a specific criticism of the ESCRS study was the high rate of endophthalmitis in patients not randomized to receive IC cefuroxime, which may have exaggerated the apparent treatment benefits. The most commonly used antibiotics for intraocular prophylaxis are cefuroxime, moxifloxacin, and vancomycin. Cefuroxime, a second-generation cephalosporin, was initially studied for IC prophylaxis by Montan et al. in the early 1990s., Moxifloxacin is a fourth-generation fluoroquinolone that was approved for systemic use in the US in 1999 and for topical ophthalmic use in 2003. 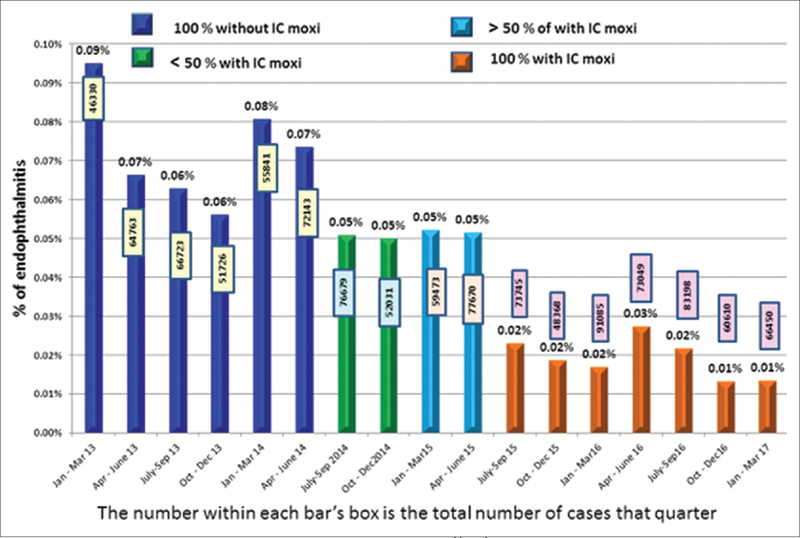 IC moxifloxacin achieves bactericidal levels at least 10 times the MIC of the most resistant bacteria for a limited time period, but because of its potent dose-dependent activity even at low injection concentrations, it remains bactericidal for a much longer duration than cefuroxime. Vancomycin is a broad-spectrum antibiotic that has been a common choice for intraocular endophthalmitis prophylaxis, but there is no preparation that is commercially approved for IC use. Most commonly, 1 mg/0.1 ml of the drug is injected intracamerally at the end of surgery. In the 2014 ASCRS survey, this was the most commonly used antibiotic among those respondents employing IC prophylaxis –37% overall and 52% of American respondents. Au et al. analyzed data from 2000 to 2014 and concluded that the routine use of IC vancomycin was responsible for the dramatic decline in the incidence of postoperative endophthalmitis at their hospital in Sydney. Numerous studies have all reported efficacy of IC antibiotic prophylaxis; however, they are all retrospective in design [Table 1]. Javitt's editorial elegantly summarizes the multiple reasons that a prospective, randomized, placebo-controlled trial is so difficult, expensive, impractical, and potentially unethical to now perform. Because of this, large retrospective trials offer the next best clinical assessment of IC antibiotic prophylaxis efficacy. Rationale for using IC antibiotics is that corneal incisions may permit influx of fluid during surgery even after hydration of the main incision and side port. In spite of using preoperative antibiotics and povidone-iodine and following careful sterilization and aseptic protocols, the rate of intraocular bacterial contamination has shown to be as high as 31%. Injecting antibiotics intracamerally at the end of surgery is intended to kill bacterial microbes that have been introduced during the procedure. Posterior capsular rupture is one of the strongest risk factors for infectious endophthalmitis. There is strong evidence that IC antibiotics reduce the risk of endophthalmitis in eyes with this complication. Daien et al. in another paper concluded that the incidence of postoperative endophthalmitis among patients with a perioperative capsular rupture was lower for those who received an injection of cefuroxime than for those who did not. This practice is becoming more popular worldwide. The 2014 ASCRS endophthalmitis prophylaxis survey found that 50% of the 1147 global respondents are injecting an IC antibiotic at the conclusion of surgery. This is significantly more than in the comparable 2007 ASCRS endophthalmitis prophylaxis survey, where 30% of respondents were using intraocular antibiotic prophylaxis. A recent review article suggests that the practice of administering IC antibiotics is lower in the United States compared to many other non-US countries primarily because of the nonavailability of a commercially available antibiotic drug for IC use. Should a commercially manufactured, approved IC antibiotic become available, it is reasonable to suspect that more US surgeons would adopt it. A large number of recent international retrospective studies , have found a significant decrease in the postoperative endophthalmitis rate following initiation of IC cefuroxime prophylaxis. Creuzot-Garcher et al. reported on 6,371,242 eyes over the 10-year period from 2005 to 2014. They state that the increased number of cefuroxime IC injections and the availability of a commercial preparation of cefuroxime occurred at the same time enabled a substantial decrease in acute POE after phacoemulsification cataract surgery in France. The approval in multiple European countries of a commercial cefuroxime preparation for IC injection (Aprokam, Thea) has led to a significant increase in IC antibiotic prophylaxis in these countries. The 2013 ESCRS endophthalmitis prophylaxis guidelines support using a commercially approved cefuroxime formulation based on the published evidence. A 2014 ESCRS survey showed that 74% of the respondents regularly employed IC antibiotic prophylaxis. The review by Kessel et al., which looked at acceptance of practices following introduction of guidelines, states that even before the ESCRS guidelines were released, all respondents used IC cefuroxime. The question of preferred practice for prevention of endophthalmitis has been studied time and again by several investigators and societies.,,,,,, The use of preoperative and perioperative antibiotics varies widely between and within countries. Unavailability of Aprokam outside the European region explains why the 2014 ASCRS survey found that, in addition to cefuroxime, vancomycin and moxifloxacin are also commonly used by those respondents injecting antibiotics intracamerally. In India and several other countries outside Europe and the U.S., specific IC preparations of moxifloxacin have been available since 2013. Injection of 0.1 cc containing 500 μg of these ready to use commercial preparations achieve anterior chamber concentrations exceeding 1 mg/mL. Our early experience using IC moxifloxacin (Auromox, Aurolab, India) for endophthalmitis prophylaxis on charity patients of the Madurai, Aravind Eye Hospital, showed a significant 4-fold reduction in endophthalmitis rate in eyes which underwent M-SICS. Based on this positive experience, routine IC moxifloxacin prophylaxis became standard at all the ten surgical facilities of the Aravind Eye Care System. When the endophthalmitis rate was analyzed in more than 600,000 consecutive cataract surgeries performed over a 2.5 year period, we saw significant overall endophthalmitis reduction from 0.07% to 0.02%. This was separately true for both phacoemulsification (7-fold) and M-SICS (3.5-fold), and at each of the large regional centers individually. New 51-month Aravind data on 1,087,907 consecutive cataract surgeries was reported in October 2017 [Figure 1]. Similarly, the pre-IC moxifloxacin endophthalmitis rate was 0.07% (376/532,357) and the post-IC moxifloxacin rate continued to be 3.5-fold lower at 0.02% (107/555,550). While there is strong evidence supporting the efficacy of IC antibiotic prophylaxis, the most important deterrent appears to be the lack of a commercially approved preparation in most countries, and this explains the wide global variation in this practice. Using pharmacies to compound antibiotics raises theoretical risk of introducing contaminants or adjuvants that can cause toxic anterior segment syndrome. Mixing antibiotics in the operating room raises the theoretical risk of dosing errors. Le Du reported 6 cases of macular toxicity following suspected overdose of IC cefuroxime. In many countries, moxifloxacin can be compounded for IC prophylaxis by outsourcing compounding pharmacies. IC injection of Vigamox brand topical moxifloxacin, which is unpreserved, is a more popular option. Several studies have reported on the method and the safety of using topical branded Vigamox for IC prophylaxis., Generic topical moxifloxacin contains preservatives and other adjuvants that are not safe for intraocular use. Availability and use of a commercially available preparation will go a long way in curtailing some of the accidents that may happen in terms of dosing and maintaining sterility. At least two cases of anaphylaxis associated with IC cefuroxime injection have been reported in the literature., A large French study looked for difference in the risk for cystoid macular edema between the group that received and did not receive IC cefuroxime, there was no increased risk in either group. Although IC vancomycin was the most popular antibiotic chosen for intraocular prophylaxis in both the 2007 and 2014 ASCRS surveys, new evidence regarding its association with hemorrhagic occlusive retinal vasculitis (HORV) has led many surgeons to seek an alternative.,,, Findings of a joint ASCRS-American Society of Retina Specialists task force on HORV were subsequently published, and included 36 eyes from 23 patients (13 bilateral cases). Every single case occurred following uncomplicated cataract surgery in which intraocular vancomycin was administered. HORV appears to be a type III hypersensitivity reaction, because the onset is delayed (mean onset after one week) and exposure of the second eye results in an earlier and more severe vasculitis. Outcomes are frequently poor because of rapid onset of neovascular glaucoma. Although likely very rare, the true incidence of this devastating complication is unknown, and many surgeons have abandoned vancomycin for routine endophthalmitis prophylaxis. Concerns have been raised that routine intraocular antibiotic prophylaxis can lead to increasing bacterial drug resistance. The recent editorial by Naseri et al. effectively quiets this concern because 1-time, highly concentrated dose of antibiotic injected into a physiologically isolated space is extremely unlikely to promote bacterial resistance. In fact, the concern over promoting antibiotic resistance should be directed more toward the common use of topical antibiotic prophylaxis. Endophthalmitis caused by cefuroxime-resistant organisms has been reported. At the International Intraocular Implant Club Symposium on postoperative endophthalmitis held at the 20th Congress of the European Ophthalmological Society in Vienna, Austria, June 7, 2015, Anders Behndig presented data from the Swedish National Cataract Surgery Database suggesting that the overall postoperative endophthalmitis rates with IC cefuroxime and moxifloxacin were similar. However, postoperative endophthalmitis after cefuroxime prophylaxis was associated with worse visual outcomes, largely due to a higher proportion of cases infected with resistant Enterobacter species. This raised a concern over increasing rates of cefuroxime-resistant gram-negative isolates in Sweden. Cost of IC antibiotic is also considered a barrier for administration to all patients on a routine basis. However, our previous study found that the savings from treating fewer endophthalmitis patients offset the cost of routine moxifloxacin IC prophylaxis. The high retail cost of IC moxifloxacin would only be true for off-label IC use of Vigamox in the United States without insurance coverage. Common practice is to use the same bottle for topical prophylaxis resulting in no additional cost to patients using topical Vigamox. Au et al. showed that IC vancomycin is also cost-effective in preventing postoperative endophthalmitis. While the debate regarding the safety and efficacy of using IC antibiotic prophylaxis continues, a recent Cochrane review  analyzed studies that had been published through December 2016 and concluded that the 2007 ESCRS study demonstrated the efficacy of using IC antibiotics for reducing endophthalmitis. However, the antibiotic of choice may differ based on the clinical setting. Numerous recent review articles have discussed in detail the evidence towards and against routine use of IC antibiotic prophylaxis.,,, We agree with the 2016 American Academy of Ophthalmology Cataract Preferred Practice Pattern's assessment of the published literature that “there is mounting evidence that injecting IC antibiotics as a bolus at the conclusion of surgery is an efficacious method of endophthalmitis prophylaxis.” There is much stronger evidence supporting the efficacy of IC antibiotic injection than for topical administration for endophthalmitis prophylaxis. Nanavaty MA, Wearne MJ. Perioperative antibiotic prophylaxis during phaco-emulsification and intraocular lens implantation: National survey of smaller eye units in England. Clin Exp Ophthalmol 2010;38:462-6. García-Sáenz MC, Arias-Puente A, Rodríguez-Caravaca G, Bañuelos JB. Effectiveness of intracameral cefuroxime in preventing endophthalmitis after cataract surgery ten-year comparative study. J Cataract Refract Surg 2010;36:203-7. Haripriya A, Chang DF, Ravindran RD. Endophthalmitis reduction with intracameral moxifloxacin prophylaxis: Analysis of 600 000 surgeries. Ophthalmology 2017;124:768-75. Gentile RC, Shukla S, Shah M, Ritterband DC, Engelbert M, Davis A,et al. Microbiological spectrum and antibiotic sensitivity in endophthalmitis: A 25-year review. Ophthalmology 2014;121:1634-42. Behndig A, Cochener B, Güell JL, Kodjikian L, Mencucci R, Nuijts RM,et al. Endophthalmitis prophylaxis in cataract surgery: Overview of current practice patterns in 9 european countries. J Cataract Refract Surg 2013;39:1421-31. Haripriya A, Lalitha P, Mathen M, Prajna NV, Kim R, Shukla D,et al. Nocardia endophthalmitis after cataract surgery: Clinicomicrobiological study. Am J Ophthalmol 2005;139:837-46. Moloney TP, Park J. Microbiological isolates and antibiotic sensitivities in culture-proven endophthalmitis: A 15-year review. Br J Ophthalmol 2014;98:1492-7. Kessel L, Flesner P, Andresen J, Erngaard D, Tendal B, Hjortdal J,et al. Antibiotic prevention of postcataract endophthalmitis: A systematic review and meta-analysis. Acta Ophthalmol 2015;93:303-17. Grzybowski A, Kuklo P, Pieczynski J, Beiko G. A review of preoperative manoeuvres for prophylaxis of endophthalmitis in intraocular surgery: Topical application of antibiotics, disinfectants, or both? Curr Opin Ophthalmol 2016;27:9-23. Barry P, Cordovés L, Gardner S. ESCRS guidelines for prevention and treatment of endophthalmitis following cataract surgery: Data, dilemmas and conclusions. Eur Soc Cataract Refract Surg Dublin 2013. Available from: http://www.escrs.org/downloads/ endophthalmitis-guidelines.pdf. [Last accessed on 2017 Nov 08]. Barry P, Seal DV, Gettinby G, Lees F, Peterson M, Revie CW,et al. ESCRS study of prophylaxis of postoperative endophthalmitis after cataract surgery: Preliminary report of principal results from a European multicenter study. J Cataract Refract Surg 2006;32:407-10. Endophthalmitis Study Group, European Society of Cataract & Refractive Surgeons. Prophylaxis of postoperative endophthalmitis following cataract surgery: Results of the ESCRS multicenter study and identification of risk factors. J Cataract Refract Surg 2007;33:978-88. Montan PG, Wejde G, Koranyi G, Rylander M. Prophylactic intracameral cefuroxime. Efficacy in preventing endophthalmitis after cataract surgery. J Cataract Refract Surg 2002;28:977-81. Montan PG, Wejde G, Setterquist H, Rylander M, Zetterström C. Prophylactic intracameral cefuroxime. Evaluation of safety and kinetics in cataract surgery. J Cataract Refract Surg 2002;28:982-7. Arshinoff SA, Modabber M. Dose and administration of intracameral moxifloxacin for prophylaxis of postoperative endophthalmitis. J Cataract Refract Surg 2016;42:1730-41. Au CP, White AJ, Healey PR. Efficacy and cost-effectiveness of intracameral vancomycin in reducing postoperative endophthalmitis incidence in Australia. Clin Exp Ophthalmol 2016;44:803-11. Tan CS, Wong HK, Yang FP. Epidemiology of postoperative endophthalmitis in an Asian population: 11-year incidence and effect of intracameral antibiotic agents. J Cataract Refract Surg 2012;38:425-30. Barreau G, Mounier M, Marin B, Adenis JP, Robert PY. Intracameral cefuroxime injection at the end of cataract surgery to reduce the incidence of endophthalmitis: French study. J Cataract Refract Surg 2012;38:1370-5. Rodríguez-Caravaca G, García-Sáenz MC, Villar-Del-Campo MC, Andrés-Alba Y, Arias-Puente A. Incidence of endophthalmitis and impact of prophylaxis with cefuroxime on cataract surgery. J Cataract Refract Surg 2013;39:1399-403. Friling E, Lundström M, Stenevi U, Montan P. Six-year incidence of endophthalmitis after cataract surgery: Swedish national study. J Cataract Refract Surg 2013;39:15-21. Matsuura K, Miyoshi T, Suto C, Akura J, Inoue Y. Efficacy and safety of prophylactic intracameral moxifloxacin injection in japan. J Cataract Refract Surg 2013;39:1702-6. Sharma S, Sahu SK, Dhillon V, Das S, Rath S. Reevaluating intracameral cefuroxime as a prophylaxis against endophthalmitis after cataract surgery in India. J Cataract Refract Surg 2015;41:393-9. Herrinton LJ, Shorstein NH, Paschal JF, Liu L, Contreras R, Winthrop KL,et al. Comparative effectiveness of antibiotic prophylaxis in cataract surgery. Ophthalmology 2016;123:287-94. Jabbarvand M, Hashemian H, Khodaparast M, Jouhari M, Tabatabaei A, Rezaei S,et al. Endophthalmitis occurring after cataract surgery: Outcomes of more than 480 000 cataract surgeries, epidemiologic features, and risk factors. Ophthalmology 2016;123:295-301. Daien V, Papinaud L, Gillies MC, Domerg C, Nagot N, Lacombe S,et al. Effectiveness and safety of an intracameral injection of cefuroxime for the prevention of endophthalmitis after cataract surgery with or without perioperative capsular rupture. JAMA Ophthalmol 2016;134:810-6. Javitt JC. Intracameral antibiotics reduce the risk of endophthalmitis after cataract surgery: Does the preponderance of the evidence mandate a global change in practice? Ophthalmology 2016;123:226-31. Balestrazzi A, Malandrini A, Montagnani F, Nguisseu Chegoua GL, Ciompi L, Zanchi A,et al. Phacoemulsificator and sterile drapes contamination during cataract surgery: A microbiological study. Eur J Ophthalmol 2012;22:188-94. Chang DF, Braga-Mele R, Henderson BA, Mamalis N, Vasavada A, ASCRS Cataract Clinical Committee,et al. Antibiotic prophylaxis of postoperative endophthalmitis after cataract surgery: Results of the 2014 ASCRS member survey. J Cataract Refract Surg 2015;41:1300-5. Chang DF, Braga-Mele R, Mamalis N, Masket S, Miller KM, Nichamin LD,et al. Prophylaxis of postoperative endophthalmitis after cataract surgery: Results of the 2007 ASCRS member survey. J Cataract Refract Surg 2007;33:1801-5. Schwartz SG, Grzybowski A, Flynn HW Jr. Antibiotic prophylaxis: Different practice patterns within and outside the United States. Clin Ophthalmol 2016;10:251-6. Creuzot-Garcher C, Benzenine E, Mariet AS, de Lazzer A, Chiquet C, Bron AM,et al. Incidence of acute postoperative endophthalmitis after cataract surgery: A Nationwide study in France from 2005 to 2014. Ophthalmology 2016;123:1414-20. Barry P. Adoption of intracameral antibiotic prophylaxis of endophthalmitis following cataract surgery: Update on the ESCRS endophthalmitis study. J Cataract Refract Surg 2014;40:138-42. Kessel L, Erngaard D, Flesner P, Andresen J, Hjortdal J. Do evidence-based guidelines change clinical practice patterns? Acta Ophthalmol 2017;95:337-43. Meyer JJ, Polkinghorne PJ, McGhee CN. Cataract surgery practices and endophthalmitis prophylaxis by New Zealand ophthalmologists. Clin Exp Ophthalmol 2016;44:643-5. Katz G, Blum S, Leeva O, Axer-Siegel R, Moisseiev J, Tesler G,et al. Intracameral cefuroxime and the incidence of post-cataract endophthalmitis: An Israeli experience. Graefes Arch Clin Exp Ophthalmol 2015;253:1729-33. Rahman N, Murphy CC. Impact of intracameral cefuroxime on the incidence of postoperative endophthalmitis following cataract surgery in Ireland. Ir J Med Sci 2015;184:395-8. Huang J, Wang X, Chen X, Song Q, Liu W, Lu L,et al. Perioperative antibiotics to prevent acute endophthalmitis after ophthalmic surgery: A Systematic review and meta-analysis. PLoS One 2016;11:e0166141. Chang DF, Haripriya A, Ravindran RD. Reply. Ophthalmology 2017;124:e78-9. Grzybowski A, Schwartz SG, Matsuura K, Ong Tone S, Arshinoff S, Ng JQ,et al. Endophthalmitis prophylaxis in cataract surgery: Overview of current practice patterns around the world. Curr Pharm Des 2017;23:565-73. Le Dû B, Pierre-Kahn V. Early macular edema after phacoemulsification and suspected overdose of cefuroxime: Report of six cases. J Fr Ophtalmol 2014;37:202-10. Arbisser LB. Safety of intracameral moxifloxacin for prophylaxis of endophthalmitis after cataract surgery. J Cataract Refract Surg 2008;34:1114-20. Villada JR, Vicente U, Javaloy J, Alió JL. Severe anaphylactic reaction after intracameral antibiotic administration during cataract surgery. J Cataract Refract Surg 2005;31:620-1. Moisseiev E, Levinger E. Anaphylactic reaction following intracameral cefuroxime injection during cataract surgery. J Cataract Refract Surg 2013;39:1432-4. Witkin AJ, Shah AR, Engstrom RE, Kron-Gray MM, Baumal CR, Johnson MW,et al. Postoperative hemorrhagic occlusive retinal vasculitis: Expanding the clinical spectrum and possible association with vancomycin. Ophthalmology 2015;122:1438-51. Ehmann DS, Adam MK, Kasi SK, Sivalingam A, Dunn JP. Hemorrhagic occlusive retinal vasculitis and nonhemorrhagic vasculitis after uncomplicated cataract surgery with intracameral vancomycin. Retin Cases Brief Rep 2017;11 Suppl 1:S155-8. Hsing YE, Park J. Haemorrhagic occlusive retinal vasculitis associated with intracameral vancomycin during cataract surgery. Clin Exp Ophthalmol 2016;44:635-7. Witkin AJ, Chang DF, Jumper JM, Charles S, Eliott D, Hoffman RS,et al. Vancomycin-associated hemorrhagic occlusive retinal vasculitis: Clinical characteristics of 36 eyes. Ophthalmology 2017;124:583-95. Schwartz SG, Flynn HW Jr., Grzybowski A, Relhan N, Ferris FL 3rd. Intracameral antibiotics and cataract surgery: Endophthalmitis rates, costs, and stewardship. Ophthalmology 2016;123:1411-3. Naseri A, Melles RB, Shorstein NH. Intracameral antibiotics in the shadow of hemorrhagic occlusive retinal vasculitis. Ophthalmology 2017;124:580-2. Mesnard C, Beral L, Hage R, Merle H, Farès S, David T,et al. Endophthalmitis after cataract surgery despite intracameral antibiotic prophylaxis with licensed cefuroxime. J Cataract Refract Surg 2016;42:1318-23. Olson RJ. Has the time come for all to routinely use intracameral antibiotic prophylaxis at the time of cataract surgery? Am J Ophthalmol 2016;166:xii-xiv. Lipnitzki I, Ben Eliahu S, Marcovitz AL, Ezov N, Kleinmann G. Intraocular concentration of moxifloxacin after intracameral injection combined with presoaked intraocular lenses. J Cataract Refract Surg 2014;40:639-43. Yovel OS, Ben Eliahu S, Kleinmann G. Prevention of Staphylococcus epidermidis endophthalmitis by different moxifloxacin prophylaxis routes. Curr Drug Deliv 2016;13:90-4. Gower EW, Lindsley K, Tulenko SE, Nanji AA, Leyngold I, McDonnell PJ,et al. Perioperative antibiotics for prevention of acute endophthalmitis after cataract surgery. Cochrane Database Syst Rev 2017;2:CD006364. Hashemian H, Mirshahi R, Khodaparast M, Jabbarvand M. Post-cataract surgery endophthalmitis: Brief literature review. J Curr Ophthalmol 2016;28:101-5. Garg P, Roy A, Sharma S. Endophthalmitis after cataract surgery: Epidemiology, risk factors, and evidence on protection. Curr Opin Ophthalmol 2017;28:67-72. Haripriya A, Baam ZR, Chang DF. Endophthalmitis prophylaxis for cataract surgery. Asia Pac J Ophthalmol (Phila) 2017;6:324-9. Al-Abduljabbar KA, Stone DU. Risks of cefuroxime prophylaxis for postcataract endophthalmitis. Middle East Afr J Ophthalmol 2017;24:24-9. Olson RJ, Braga-Mele R, Chen SH, Miller KM, Pineda R 2nd, Tweeten JP,et al. Cataract in the adult eye preferred practice pattern®. Ophthalmology 2017;124:P1-119.